How Low Will Bruce Rauner Go? A new poll of Illinois’ gubernatorial race conducted by Capitol Fax/We Ask America found Democratic billionaire challenger J.B. Pritzker leading first term Governor Bruce Rauner by nine points. Rauner is considered perhaps the most vulnerable Republican gubernatorial incumbent this cycle and a survey finding him with a near double-digit deficit is not surprising. Seeing Rauner’s support come in at 27 percent, however, is a bit eye-opening. To be sure, both Rauner and Pritzker are not the most beloved political figures at the moment in the Prairie State with the governor only narrowly winning his party’s nomination by 3.1 points against state legislator Jeanne Ives and the Pritzker emerging with only plurality support against five other candidates. The poll of 600 likely voters found 36 percent support for Pritzker with 26 percent for (unnamed) third-party candidates and 11 percent undecided. Filing for independent and third party candidates opened a week ago and closes this Monday – June 25th. Independent Mary Vann-Metcalf has already filed with the state while Navy veteran and Libertarian nominee Kash Jackson and Republican State Senator Sam McCaan running as the Conservative Party nominee are hoping to meet the state’s requirement of 25,000 signatures. Despite the large support in the new poll for non-major party candidates, Smart Politics has previously reported how only four of the 106 such gubernatorial candidates since statehood have reached double-digits, and only six others have reached the five percent mark. And so, while Governor Rauner currently has some of the weakest approval numbers in the nation and even though Pritzker may not be inspiring progressives in droves to get behind his campaign, it seems unlikely that these major party nominees will fail to gather a significant percentage of votes from those currently stating they will back a third party candidate. That said, Rauner has a lot of work to do if he wants to avoid recording one of the worst performances by an incumbent governor in a general election in Illinois history. For starters, it should be noted that it has not been unusual for a sitting governor seeking another term in Illinois to fail to win over a majority of voters. All told, 13 of 23 incumbents have fallen short of the 50 percent mark in general elections over the last 170 years since the first time a sitting governor ran for reelection (Democrat Augustus French in 1848). [Note: That tally does not include two governors who were rejected by the voters in direct primaries and failed to make the general election ballot – Republican Len Small in 1928 and Democrat Dan Walker in 1976]. That said – all but one of these 23 incumbents received at least 42 percent of the general election vote. The governor tallying the least support over the decades in the quest for another term was two-term incumbent Charles Deneen in 1912. Republican support was fractured that cycle, of course, with Teddy Roosevelt at the top of the Progressive ticket and Deneen managed a second place finish with just 27.4 percent. [Progressive and former state Senator Frank Funk placed third with 26.1 percent]. Rauner will have to gather support from another 15 percent of Illinois voters from his 27 percent baseline measured in the Capitol Fax/We Ask America poll to avoid recording the second worst showing by a governor in Illinois history. In 1916, first-term Democrat Edward Dunne won 42.1 percent in a 10.6-point loss to former Congressman Frank Lowden in a vote that mirrored the presidential race at the top of the ticket in the state between Charles Hughes and Woodrow Wilson. In general, it has not unusual for victorious gubernatorial candidates across the country to win with a plurality of the vote. Since the turn of the 20th Century, candidates with a plurality have won gubernatorial elections more than 270 times. 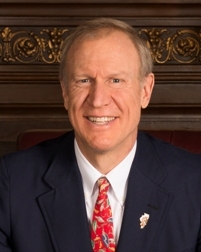 3 Comments on "How Low Will Bruce Rauner Go?" Eric, your 2nd láSt sentence above is missing the word ‘been’ ? “…it has not been unusual for victorious…plurality of the vote” For the sake of governing legitimacy (majoritarian principle), “instant runoff voting” (also known as preferred voting, or cumulative voting) ought to be implemented for at least the primary and general elections for the state chief executive post, amend the constitution if it has to come to that (looking at you, Maine), rather than just for the mayoral and county executive elections in a handful of localities.